Ms. SpoolTeacher spent most of her employed career working in Clients homes, helping them design their interior spaces. 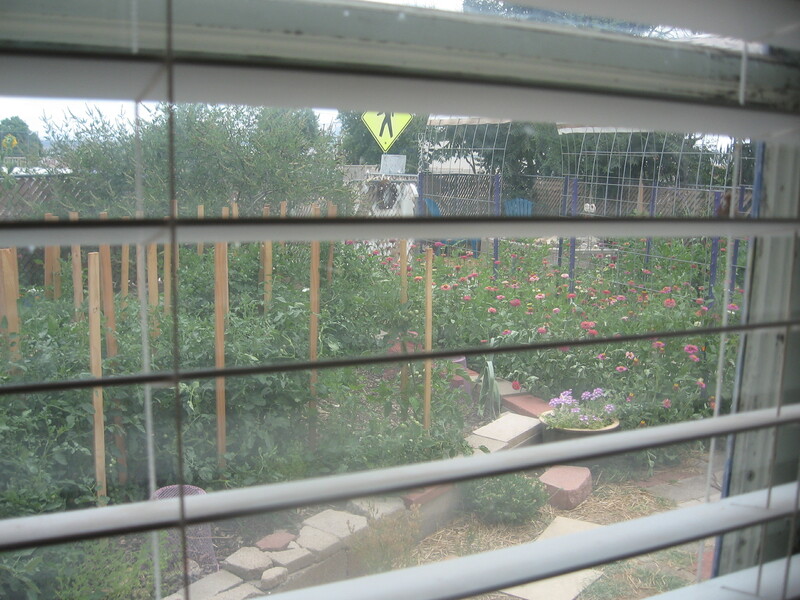 At least 50% of those efforts were focused on window covering ideas. This endeavor was almost always the foot-in-the-door to other work. People would first visit the store she was working for wanting to know what to do for their windows. Privacy is always a first concern in new building. Often that would evolve into whole house planning; floors, walls, windows, furnishings and accessories. She loved her work, she just didn’t much like working for someone else. Most owners of stores only want top dollars fast. They usually didn’t care much for quality of design as long as something expensive/high profit got sold. Ms. SpoolTeacher, on the other hand, was still learning and wanted to hone her skills to produce quality work with integrity to establish a good reputation. Well, so, sometime down the road when she’d had about as much of that as she could stand, she opened her own little storefront and purchased tons of sample books so that she would have lots of wonderful choices for her customers. She even purchased1-1/2 yard segments of particular fabrics she favored so her clients would be able to handle large pieces and see the real value of choosing quality over price. Now that she is semi-retired, she is trying to find a way to utilize all of those wonderful sample books and pieces. 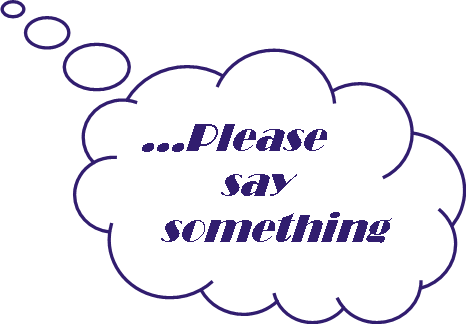 She sees lots of great ideas on Etsy that she is sure people have been using the same kind of resources to make their products. Wonderful things there and totally inspiring to Ms. SpoolTeacher. She could spend all day looking to see what others have made, but she must get going on ideas of her own. 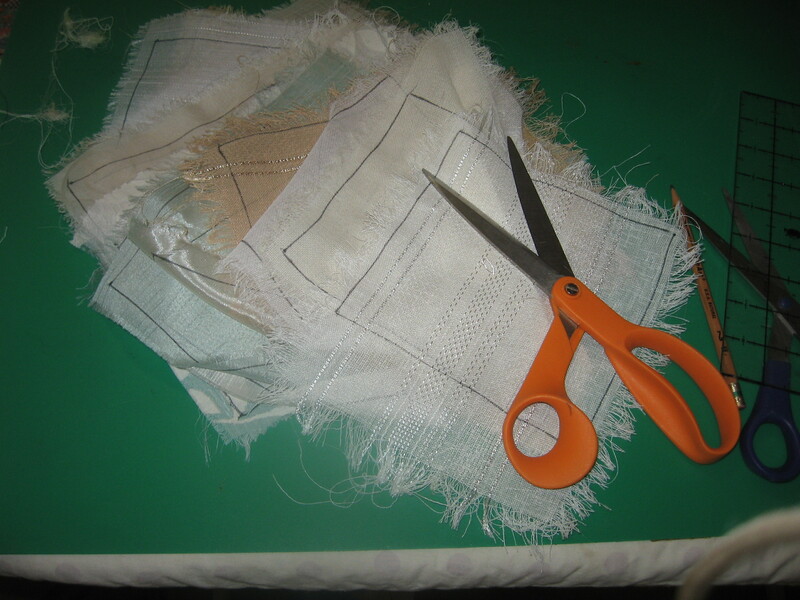 One day her muse pushed her to grab a sample book of sheers to see what she could do with it. She had an idea in her head and went with it. 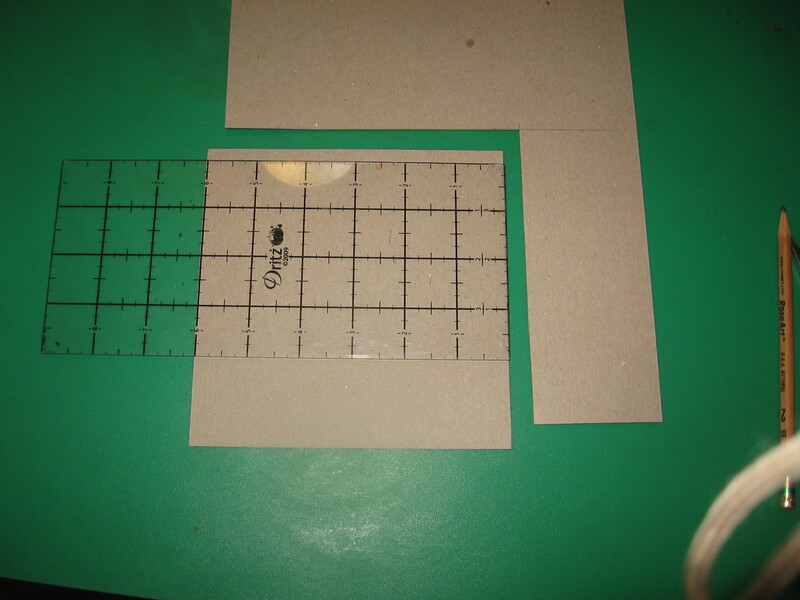 She would cut squares out, all the same size, as big as the sample book pieces would allow. 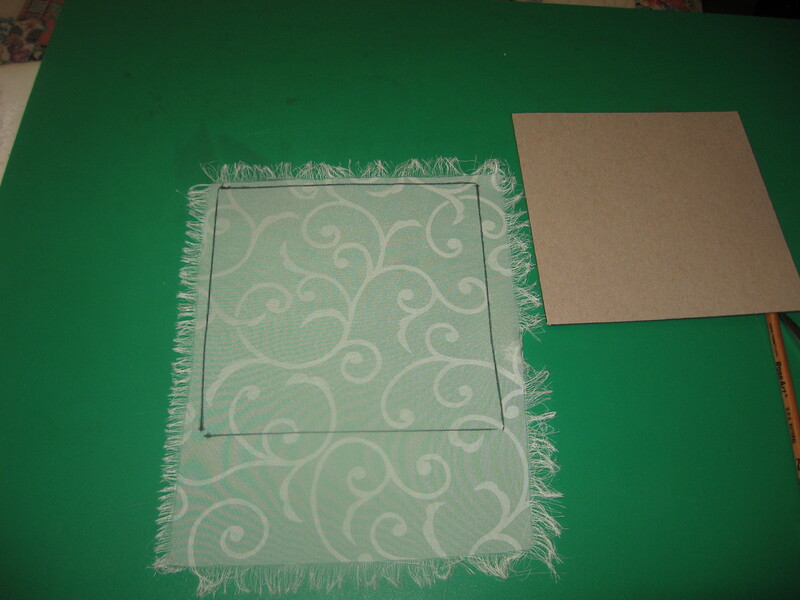 The first template she made was 5″X5″ but wasn’t to her liking, (it didn’t “feel” right) so she increased it to 6″X6″. Much better and took more of the sample. She had already torn apart the book and washed the sample pieces. Now to iron them. She does this to get the chemicals off, and hopes that whatever she makes will be washable so tests it before making it. Off to a good start. Most all of the samples performed well under the stress of the washing machine and iron. Now to cut them, assemble in a pleasing manner and put them together. 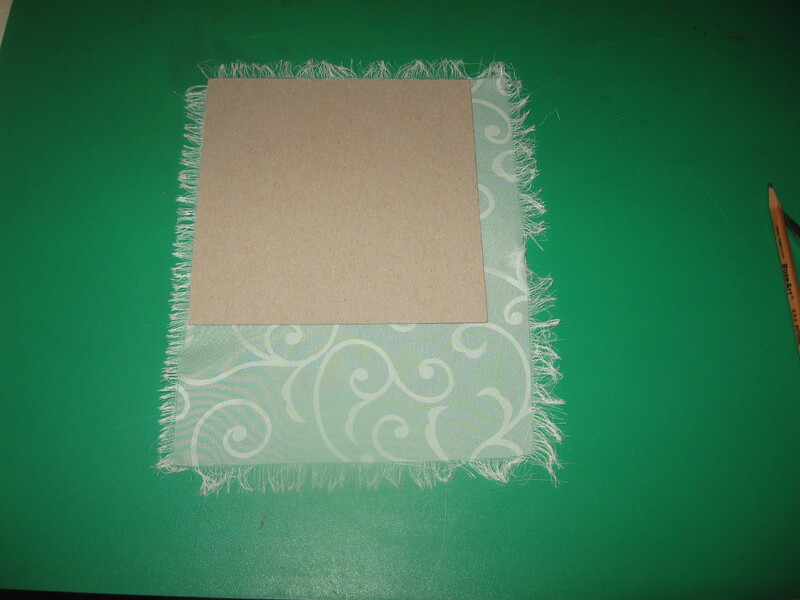 The template is placed on the sample swatch and outlined. Ms. SpoolTeacher used a black magic marker as she didn’t know where her washable marker was. She then cut inside the lines. It is somewhat important to determine the right and wrong sides of the fabrics where possible. Sometimes the choice is to use the wrong side if it happens to appeal to your senses more. It’s art. It’s your choice. Using her wonderful Fiskars scissors she cut each piece out inside the black line. Sheer is hard to handle and a rotary blade doesn’t give her the control she likes. Besides, the blades are just too expensive and “No hurry, no worry” is her constant refrain/mantra. 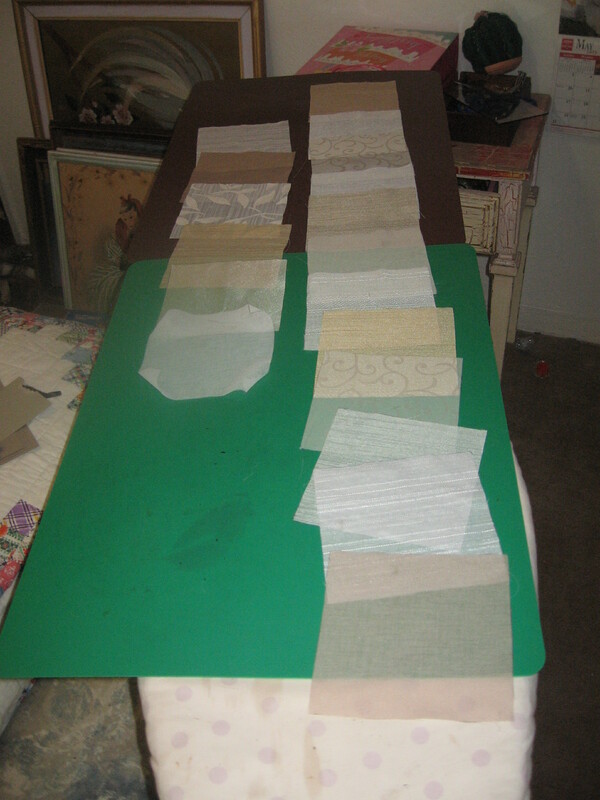 All of the sheer sample swatches cut out and ready to assemble. Next, how to “order” them. Ms. SpoolTeacher just depends on her intuition and places them as it pleases her senses. She tried to alternate like colors at equal intervals. 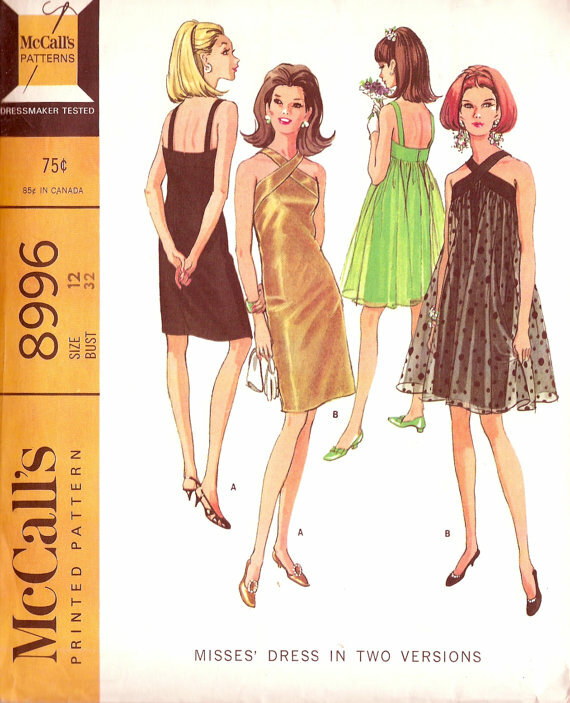 Now, the way she would seam them would be to use a full 5/8″ seem allowance but first she would stitch wrong sides together using 2/8″ (1/4″) of the 5/8″ allowance then press a nice crisp edge, place right sides together and stitch the next 3/8″ to enclose the raw edges of the first seam. 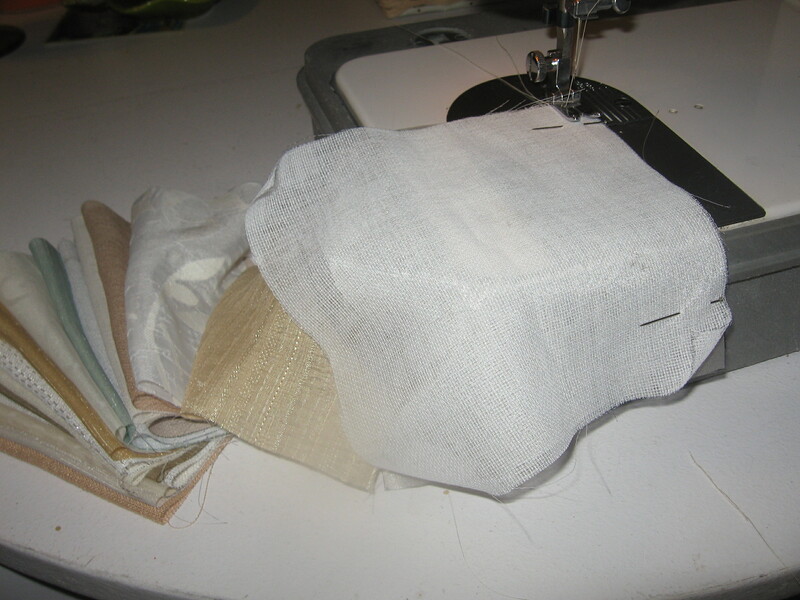 Here’s a nice “how-to” for making a French seam. Pictures speak much louder than words to a right brain (myth) artist type. Well they do to Ms. SpoolTeacher anyway. It’s messy looking but she makes the most of what she has. This is her First Do No Harm Front Yard Farmacy. If you click the link, it will take you to her Facebook page for it. 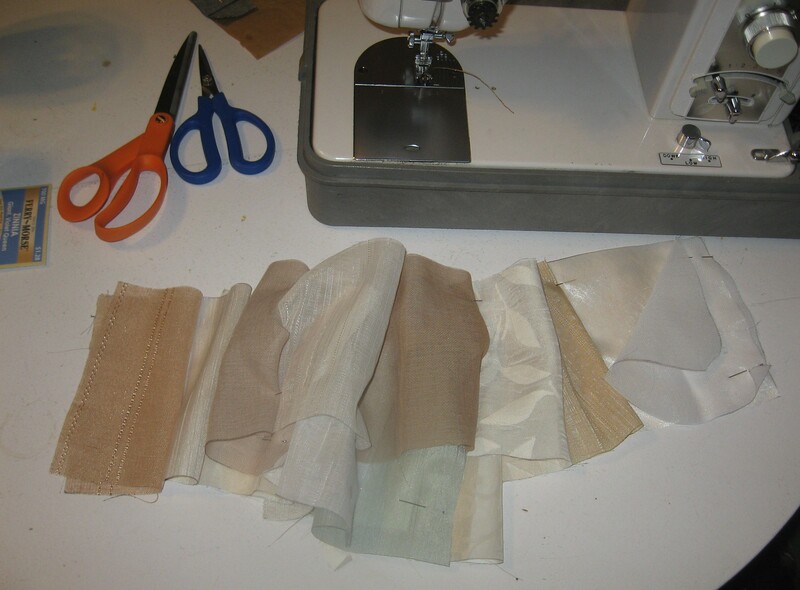 After the samples were all pinned wrong sides together, she made the 1/4″ seam. This seam will be encased after she turns it right sides together, presses a nice crisp edge and takes the other 3/8″ seam. That is a French seam. 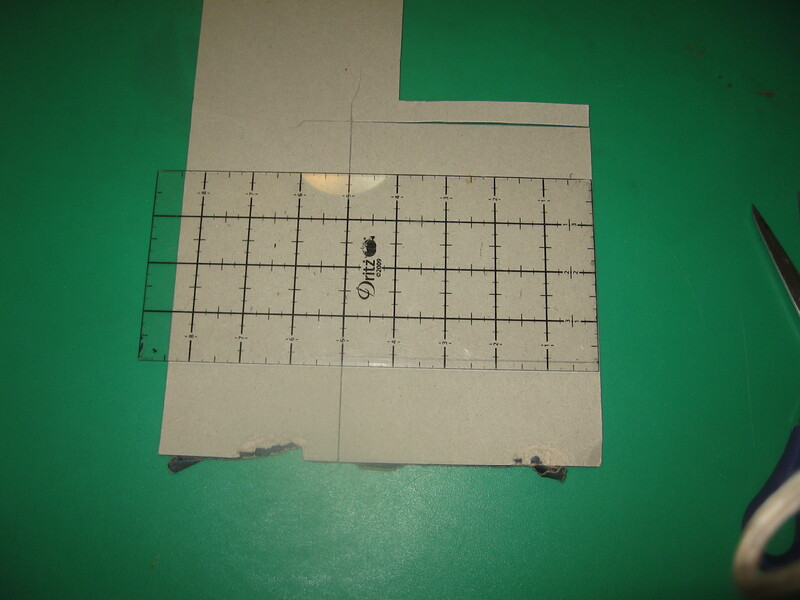 1/4″ seam allowance with wrong sides together. 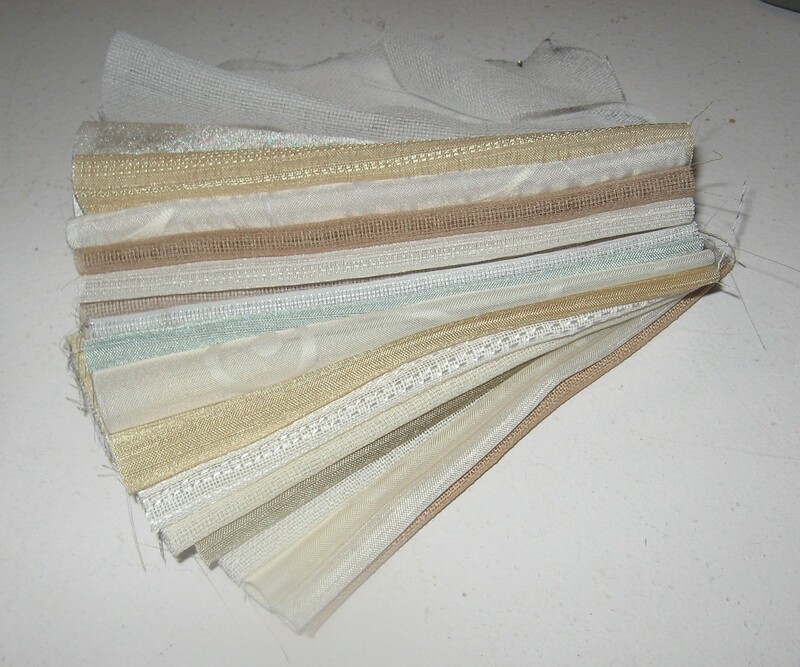 You can see how delicate and how easily the fabric frays. 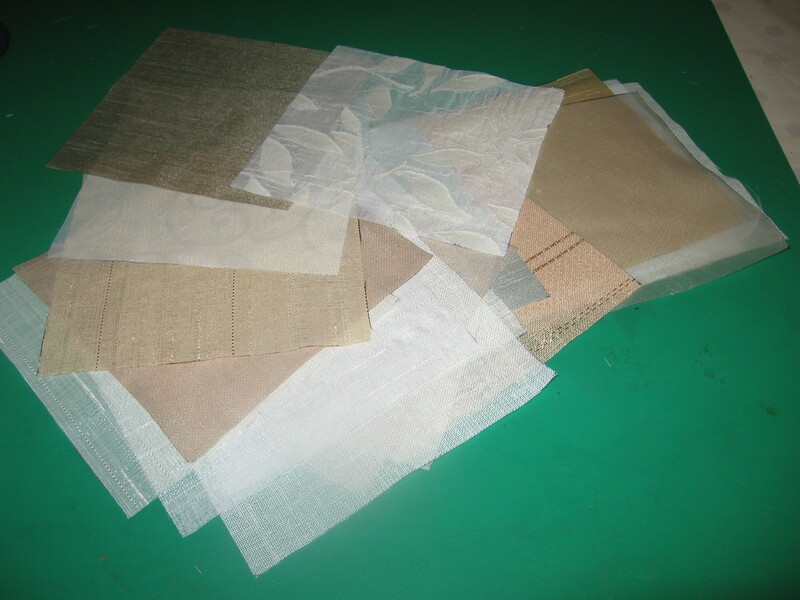 This kind of fabric is very hard to do a zig-zag edge on and for how it will be used, this kind of seam can almost be a design feature. 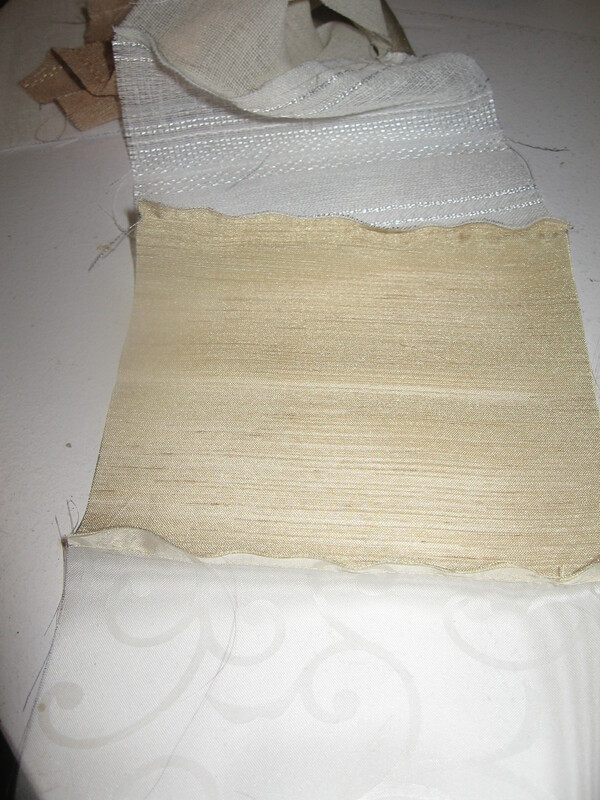 Here is the front and back sides of the finished French seam. 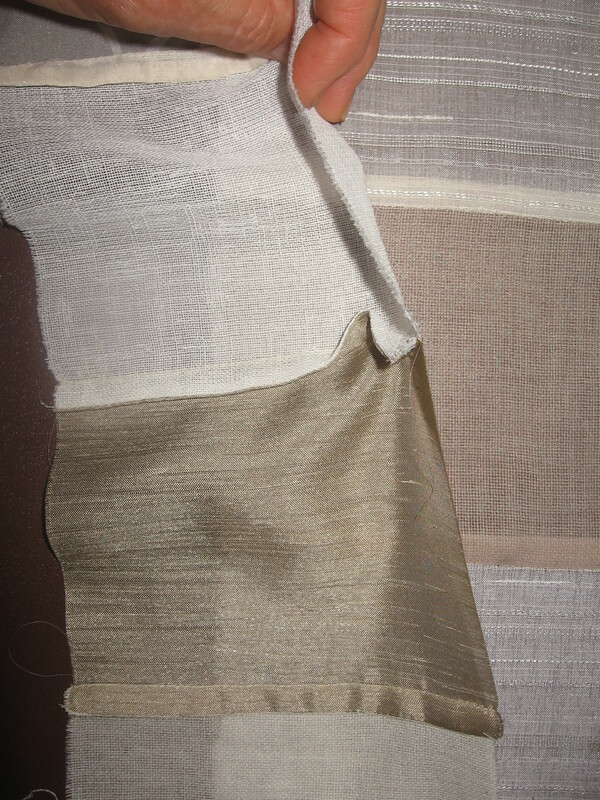 The finished seam could be further stitched down if desired. As it turned out, she realized she has several pieces she overlooked that she will do the same thing with and add to this segment. 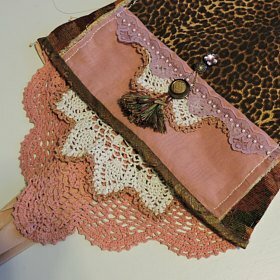 She thinks she will add this to the bottom edge of a dress she has long imagined to make using the patten that she features in the header of this blog.. This is Ms. SpoolTeacher’s favorite (“Tent”) dress from High School days and she has long wanted to remake it adjusting the pattern for a lower neckline and the sleeve holes tapered in more. 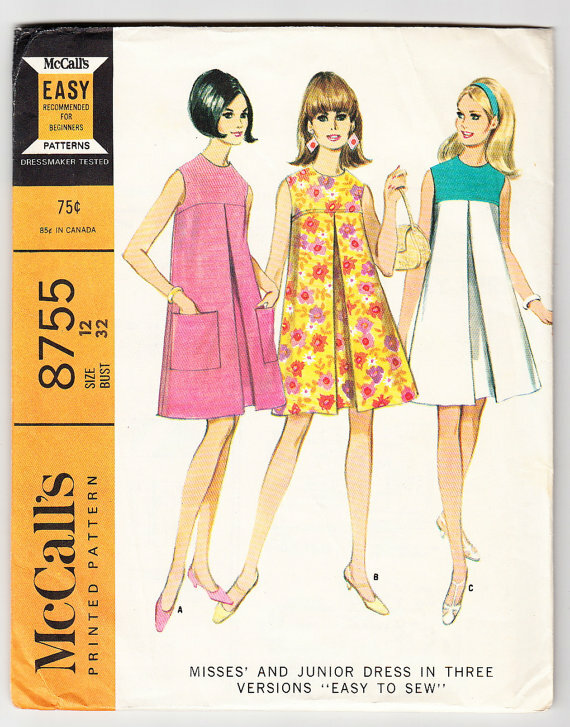 Or, she may order this pattern and make the sheer over dress part using the patchwork as a feature on the bottom edge. It could make a scarf with additional fabric added to the width. 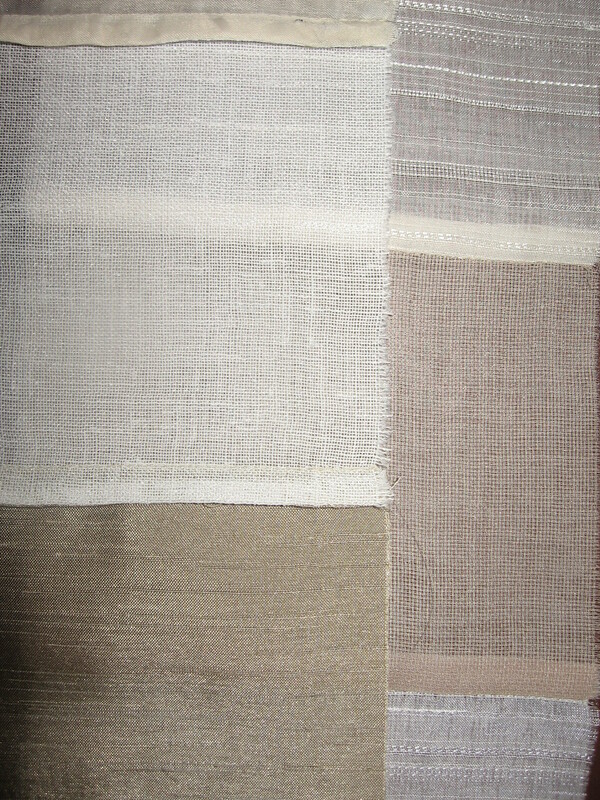 It could be used somewhere (middle) on a drapery panel for a peek-a-boo feature. There are no end of ideas. Today is Sunday and it’s raining. She was about to water the garden when there it came. Wonderful rain.